The discus throw is a track-and-field competition typically held on a field inside the track. The sport features prominently in everything from middle school track competitions to the Olympics. A discus is a circular disc typically made of wood and edged by a metal rim. Competitors vie to see who can throw a discus farthest from the discus cage onto the field. A number of fundamental rules govern how the discus throw is conducted in track-and-field events. The size and weight of the discus vary slightly for male and female competitors. For men, a discus should be approximately 22 centimeters in diameter and weigh 1.75 kilograms. For women, it should be 18 centimeters in diameter and weigh one kilogram. The metal rim should have a cross-section radius of six millimeters. 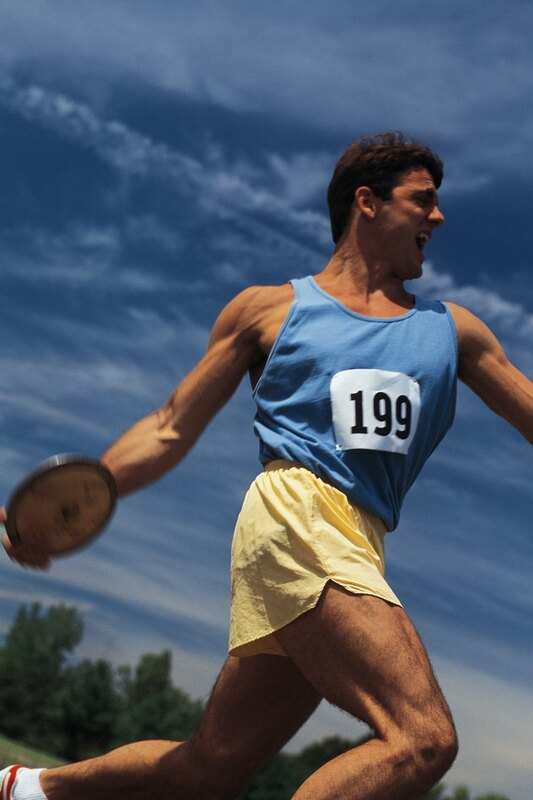 No sharp edges, protrusions or irregularities should be found on the discus. The radius from the edge of the rim to the edge of the inner circle should be 25 to 28 1/2 millimeters. A discus cage is required to capture an errant discus from harming other competitors or onlookers. The cage should be U-shaped with the mouth about 6 meters wide. Netting material should wrap around the cage; likewise, the cage should provide netting that is a minimum 4 meters from the ground. Netting can consist of natural or synthetic fiber material or steel wire. A discus circle approximately 2 1/2 meters in diameter should lie at the mouth of the discus cage. A rim borders the circle and competitors are not allowed to touch the outside edge of the rim while attempting a throw. They may, however, touch the inside edge of the rim. Discus throw regulations require the thrower to remain inside the discus circle at all times before and after each attempted throw, otherwise it is a foul. The discus must land within a designated landing area on the field; landing outside this area will invalidate the throw. Finally, in Olympic competition, each discus thrower is offered eight throws, with the best throw counted. A wind sock is required during competition to give discus throwers an indication of wind direction and speed. In addition, throwers are allowed to use chalk on their hands to obtain a suitable grip on the disc.